Online food ordering has seen tremendous growth over past couple of years. This is also visible from the fact that many small as well as larger players have come into the fray. Number of online food delivery service companies have raised significant funds in this year including TastyKhana & Foodpanda. Now, yet another company TravelKhana has secured funding from Google India head Rajan Anandan. According to VCCircle, Rajan Anandan co-invested along with Delhi- and Bangalore-based Palaash Ventures in a funding round in September-October this year. TravelKhana differs from other online food delivery services companies in the sense that they cater specifically to train commuters on Indian Railways. Rail passengers can order food over the phone with TravelKhana, which is served to them on their seats depending the route they are traveling. InOpen Technologies, an online education company incubated at IIT Bombay has raised Series A strategic investment from Japanese Education firm Benesse Holdings. InOpen had previously raised USD 500,000 seed round from venture capital firm Ventureeast. The quantum of funding done by Benesse is not disclosed. The investment is strategic in nature and will primarily be utilized to jointly develop products for the global education market, starting with the USA and Japan. InOpen currently offers educational products and services to government and private schools and are currently serving more than 5 lakh students directly. InOpen’s flagship product ‘Computer Masti’ has been implemented in over 200 schools and offers fun and easy way to impart computer science education to school students. 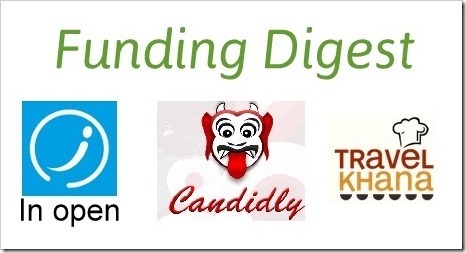 Recently launched Android based Photo sharing app, Candidly, has raised angel investment from four individual investors reports TechCircle. The quantum of funding received was not disclosed. The proceeds of funding will be utilized test marketing. Currently, the app is still in beta and allows Android users to click pictures, doodle on top of them or put comments on them in voice or text messages and share them with all friends. Interestingly, it has snapchat like feature where the photo will disappear from friends phone after 10 seconds. If you are on Android, do give this app a try!